When I was a little kid I had an awesome sweater. It was mainly black yarn, but knit onto the front were the faces of the four Ninja Turtles in neon green (with blue, red, orange, and purple for the masks, of course). I still have all three of the live-action Ninja Turtle movies on VHS. I had some of the toys and the NES games. I watched the cartoon. 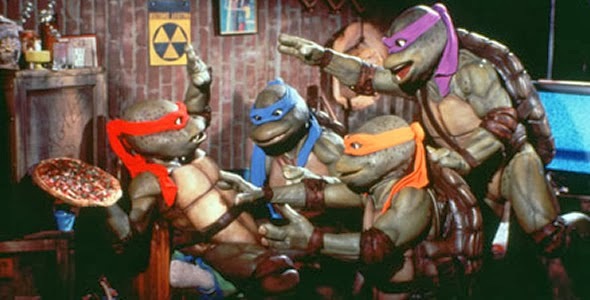 I liked the Ninja Turtles, and I still do. writing such an article, I began to wonder if I liked them because they had any merit, or simply because they were nostalgic. Nostalgia is not impartial or objective, but the opposite. It is a kind of retrospective optimism that seeps into everything it touches. Nostalgia looks back at the past through rose-tinted glasses, and then looks through the lens of the rose-tinted past at something else. This is not exactly a bad thing. Freshness, discovery, the joy of youth are all good things. But, they are symbolized by a wide range of other things, which are different for different people. The youthful joy is present in the young person, not the objects of his attention. Polar bears are great, but the excitement a little boy feels when he first sees a polar bear at the zoo is not a polar bear; the boy has brought an important part of that equation up to the bars with him. Not that feeling nostalgic about something isn’t some indication that there is good in it. Being attacked by a polar bear is something a little boy would probably not forget, but his youthful exuberance wouldn’t make him nostalgic about it 20 years later. It’s seeing the polar bear that is remembered fondly, and that must have something to do with the goodness of seeing and polar bears, as well as the goodness of youth. But, if we’re trying to talk about polar bears (or mutant turtle-men) we have to be able to separate the thing from what the thing happens to recall to us. Otherwise we not only blind ourselves to the good qualities (and defects) of the nostalgic thing, we also screw-up our calibration for judging other stuff. If the rose-tinting gets too dark, it’s just pink darkness. I’m not sure we’ll be able to, but try a mental experiment with me. Try to imagine if Star Wars: A New Hope came out last month, rather than in 1977. Would you think it was a good movie? Would the cinematography or special effects impress you? Would the acting or plot impress you? Can you be sure of impartiality in answering these questions? Star Wars (the original trilogy) is on quite a pedestal in pop-culture. Many of us have been watching them our whole lives and were introduced to them by our parents when we were little. Other things (the prequel trilogy for instance) are judged by the originals as by a standard. But nothing now (even something good, as opposed to episodes I through III) can possibly meet that standard if one of the prerequisites is “my dad and I cozied up on the couch and watched this on a Saturday.” And, really, it shouldn’t have to. It’s a fine thing to revisit your childhood, but not a fair judgment of quality to require that something had been part of it. Anyway, even apart from my boyhood love of green genetic mutants, I think the first live action Ninja Turtles movie had some pretty witty dialogue at least. Maybe I’ll cozy up on the couch some Saturday soon and see if I’m right.